In line with my blog on social performance of Microfinance Investment Vehicles: „Practicing what you preach?! Social Performance of 5 social investors“, and the one on the GIIN (Global Impact Investing Network) “Impact Investing Network: an analysis of 300 impact investing funds”; there seems to be rising demand from clients seeking to invest in companies, organisations and funds with the aim not only to achieve a financial return, but to also generate measurable social and environmental benefits. Striving to help the asset management industry to capitalise on this trend, ALFI, the Association of the Luxembourg Fund Industry, has commissioned the third responsible investing study. Its aim is to give an overview of the market by analysing recent and expected developments on both the supply and the demand side. 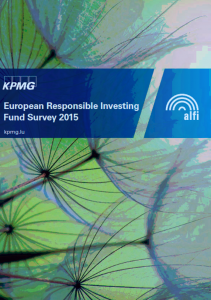 The study was designed by members of the ALFI Responsible Investing Technical Committee. This committee brings together fund directors, investment managers, consultants and service providers, experts in ESG, microfinance, impact investing, carbon finance and other related fields, all of whom share the ambition of fostering the responsible investing industry. Once again I am faced with the Dilemma that the Report is extremely interesting, but I cannot write a blog of 4-5 pages. Therefore I had to concentrate on a short summary and the main characteristics of the responsible investment industry in Europe. However, I extremely recommend to read the full Report which still has interesting information on the expectations of future investors in responsible investments, emerging trends and challenges of the industry, and the different categories of funds e.g., green funds, impact investments, and key results for ESG funds. 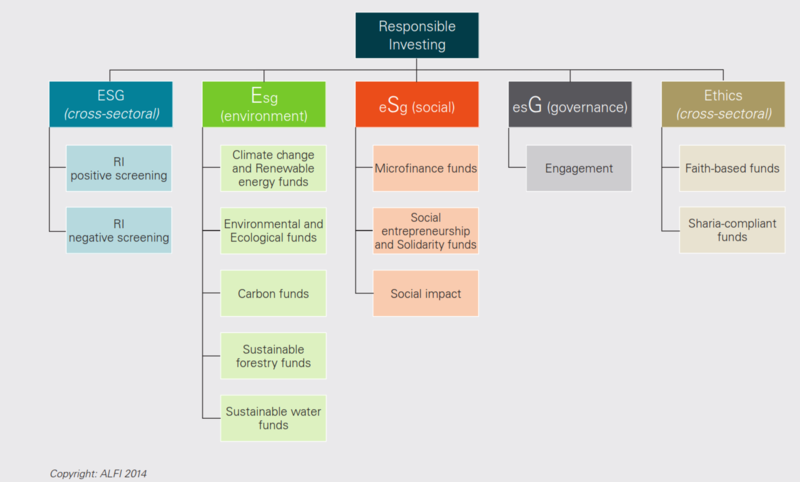 In previous versions of the study, the challenges to define, measure and report on responsible investment have been shared, primarily since a clear definition for “responsible investment” had always been missing. Even though also this edition of the report will not provide a clear definition, lines are gradually moving towards standardization. Especially organisations in France and Italy have progressed with definitions of responsible investment since the edition of the 2013 survey. 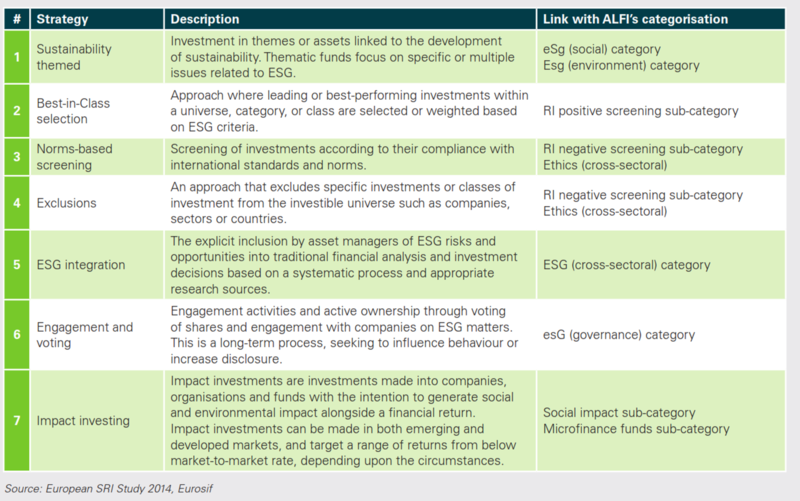 In the figure on the right, you can see the resulting categorization of the ALFI responsible investment technical committee which deliberately split the fund categories between cross-sectoral funds and thematic funds, using the widely accepted concept of Environment, Social and Governance “ESG” as classification. With this classification, the Committee strove to cover all sectors in the responsible investing space, pulling together data that has traditionally been treated separately (such as microfinance investment vehicles, impact funds, faith-based funds, etc. ), and using publicly available information. The approach taken by ALFI differs slightly from the Eurosif (European Sustainable Investment Forum) definitions, but they are complementary. 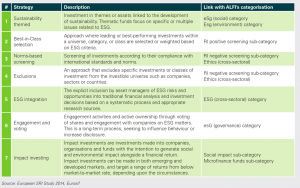 Whilst Eurosif identifies strategies or approaches to screen potential investments of a portfolio, ALFI approaches responsible in a more thematic manner, categorising investment funds by themes and according to the three pillars of sustainable development mentioned above. 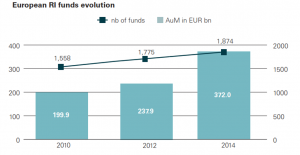 Quantifying the universe: strong AUM growth: As of December 2014, the responsible investment fund universe in Europe represented 1,874 funds with total assets under management (AUM) of EUR 372.0 billion. 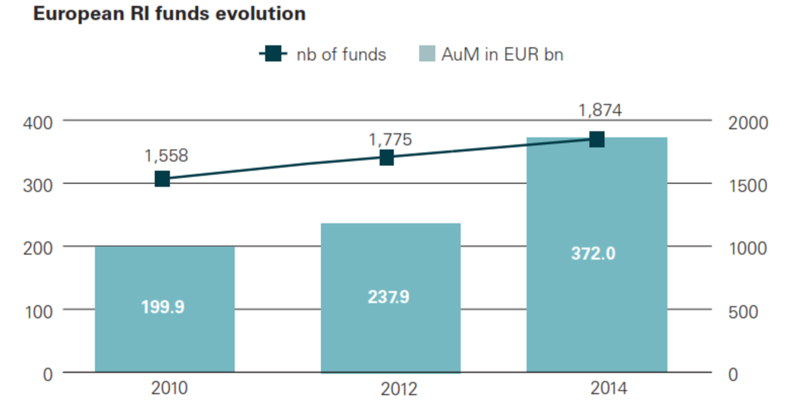 Since 2012, AUM increased by 56% while the number of funds increased by 6%. In comparison to the European fund market as a whole, this represents 3.3% of the total assets and 3.4% of the total number of funds. However, although still very small, the proportion of responsible investment assets has increased by 0.5% since to 2012. Looking at the segmentation of funds, more than two thirds of the responsible investment funds apply either a positive or a negative screening of their potential investments rather than any particular investment theme (e.g. environmental). Back in 2012, the ESG (cross-sectoral) funds represented around 83% of the total AuM of the responsible investment universe. This share has increased to 87% in 2014. 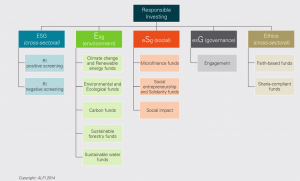 Thematic funds (environmental, social or ethical) represent approximately one third of the responsible investment funds landscape in terms of number of funds, but only 13% of the AuM in 2014. Funds investing in environmental themes remain the biggest portion of thematic funds in general. Despite a considerable decrease in AuM from 2010 to 2012, ESG (Environment) funds recovered over the past two years and reached EUR 31.8 bn as of 31 December 2014. Investments in social funds have grown by 62% since 2012 in terms of AUM which aligns with the growing interest in this sector. Ethical funds have also experienced growth over the last two years, albeit slightly lower. Despite this growth indicating continued interest in those two categories, they still remain niche. With regards to distribution, 22% of the responsible funds are sold cross-border. France and Belgium are dynamic distribution markets, certainly due to their historic commitment to responsible investment in the early days of the industry. The majority of the responsible investment funds analysed invest globally and do not apply geographical restrictions over their investment universe. 23% of the European responsible investment funds invest in the Eurozone or in Europe at large. Whilst funds investing purely in emerging markets solely represent 5%. As discussions with asset managers indicate, this is a growing market for responsible investing as the quality of the extra-financial information of target investments continues to improve. With regards to asset classes, across responsible investment funds, investments in equities represent 41% of the total AuM at the end of 2014, which represents a significant increase compared to the 34% level at end of 2012. Assets invested in bonds represent 25% of the total assets in 2014. As for money market funds, their share decreased from 22% in 2012 to 14% in 2014. This can almost certainly be attributed to the levels of returns available on different asset classes. What is ALFI? The Association of the Luxembourg Fund Industry (ALFI) is the official representative body for the Luxembourg investment fund industry and was set up in November 1988 to promote its development. Its mission is to lead industry efforts to make Luxembourg the most attractive international centre for investment funds. ALFI sets out its ambition for the Luxembourg Fund Centre, to be a global centre of excellence for the asset management industry, thereby creating opportunities for investors, fund professionals and the global community as a whole. This entry was posted in Allgemein and tagged impact investing, Luxembourg, research. Bookmark the permalink.